I made one version the “classic” neon on black, you need a silver or light gel pen to write on these (a couple of dollars at my Walmart, or Amazon). 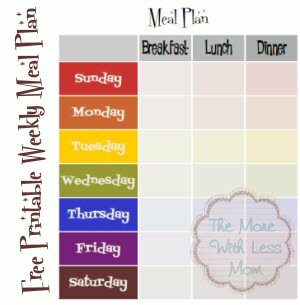 The other version has a white box with black text, so you can use a regular pen or more closely match your theme colors. These are set up to be postcard sized, four per page with no margins. You may have to make it a little smaller if your printer can’t handle the current margins. These will fit in the greeting card envelopes you can get at Walmart 50 for $3 (or Amazon, I always keep these around the house for mailing cousins little activities and things). I put some extra lines in there that you can pretend are decorations, or you can use to add more information. For example, I would put “Glow party – wear white” on the first blank line. Then “Linda’s Birthday” on the For line. The when may take two lines with both a time and date, and the where may take two lines if you need to put the full address. The RSVP can be your phone or facebook email. The last line can be extra instructions like “wear white,” or “bring a bathing suit,” or be the url for your Facebook event. The color I named the file refers to the text on the invite, ie the black one has black text and a white box to make it more readable. You asked, and I listened! 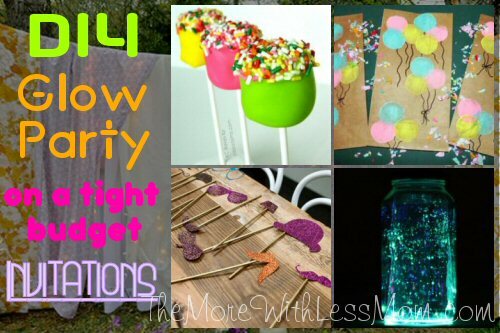 I finally dug up my originals for the glow party invitations, and have created an editable version for you. Click to open the full image, then right-click to Save. Note: Be careful how you set up privacy for your Facebook events, especially if you have addresses and phone numbers in there. What was your favorite DIY invitation? These are perfect for my teens upcoming birthday. Did you use black paper? It is a black graphic you can print on white paper. I don’t think it will print right on black paper. Yay! I’m glad you like them. Have fun! Thank you for sharing these invitations. They are perfect for my daughter’s upcoming skating party. I’m so glad you like them. That will be fun! Awesome Birthday invite! Are you able to share the editable version? I would love to be able to type in the info!!! Thanks again! Is there any way of writing on the actual invitation or making any modifications? Not at the moment, I have to dig out the original files. I might have to recreate them, but I do want to do this. adorable invites! 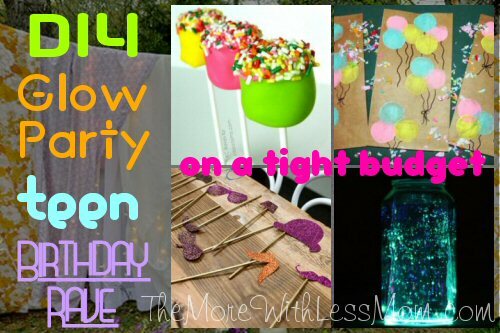 I love this idea for summer parties – perfect ! I like them, I think they would apply to so many different parties.